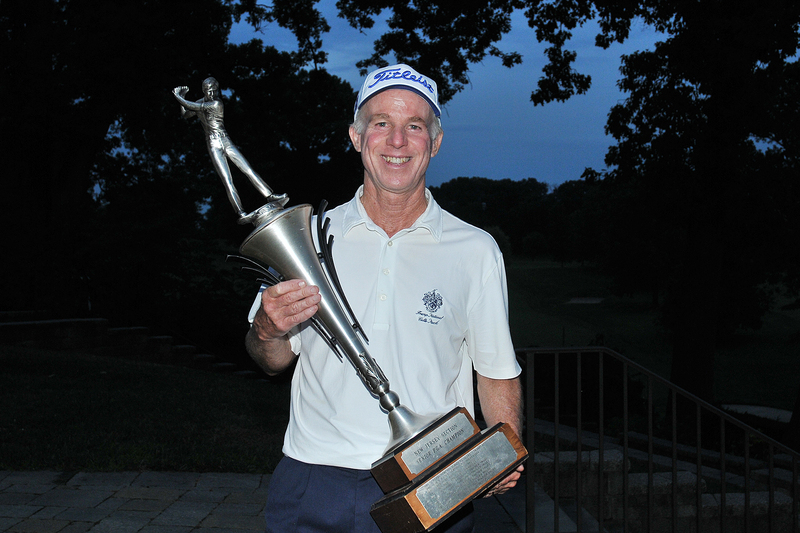 Trump Colts Neck’s Bill Britton admitted that his final round 66 at Suburban Golf Club was his best round of the year. That round, which included an eagle and five birdies, boosted him to a record sixth Senior Section Championship. Britton finished the week at 7-under, two strokes ahead of Len Siter of Mountain Ridge, who's in his first year of senior eligibility. “It feels great, I’m thrilled to have won,” the 61-year-old said. “Today [Final Round] was the best round of golf I’ve played all year. I putted really good yesterday, which kept me in today. Britton, a four-time OMEGA Senior Section Player of the Year, is now the third player since 1982 to win the event three consecutive years. Chris Dachisen won three straight years from 2008-2010, and Ed Whitman of Knickerbocker won three of his four Senior Section majors from 2003-2005. The final round began at 7:30 a.m., but a rain delay at 12:35 p.m. halted play until 5:30 p.m. After the delay, Britton bogeyed his first hole of the round on the par-3 11th, but reeled off birdies on holes 12-14. This event served as a qualifier for the 29th Senior PGA Professional Championship at Desert Mountain in Scottsdale, Arizona, September 28-October 1. Host PGA Head Professional Mark McCormick birdied three of his first four holes after the storm delay to qualify for his third straight Senior PGA Professional Championship and fourth overall. Michael Lanzetta of Mansfield Golf and Learning Center qualified for his first Senior PGA Professional Championship, tying McCormick in third place at 4-under. Paul Lejeune of Suburban, Metedeconk’s Brent Studer, and Whitman claimed the final three Senior PGA Professional Championship qualifying spots in a 4-for-3 playoff. The trio finished the week at 3-under.